Now that the International Trade Commission has completed its review of the Section 201 solar trade case, the Trump Administration has an opportunity to broaden its commitment to a strong economy and vibrant energy sector by making the right decision for America. Stands up for more than 260,000 American solar jobs and decades of American ingenuity. Doesn’t acquiesce to China, India or any other country that threatens to take this away from us. Protects free-market principles and the thousands of small businesses that rely on the ever-growing solar industry every day. Sides with cities and towns in states like Michigan, Pennsylvania, Florida and many others that have built the U.S. solar industry into what it is today. This case has been presented by some as protecting American industry from foreign manufacturers. However, as the Administration begins its formal review, I’m confident that they will recognize that the companies asking for help are German- and China-owned. They are not creating jobs for themselves or others. Just 15 years ago, the U.S. placed stiff tariffs on imported steel to protect the American steel industry. The result was the loss of 200,000 domestic jobs and $4 billion in wages in just nine months. Ultimately, the tariffs were removed early, after less than two years. History must be a guide for us now. The American solar industry is dynamic, innovative, growing, and directly connected to America’s prosperity. 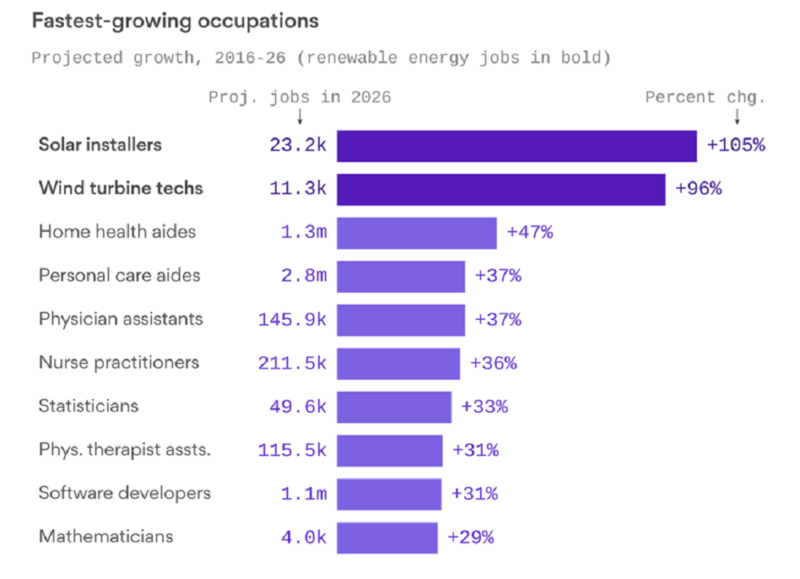 The chart below from Axios says it all – solar is producing high-paying, high-skilled jobs in states and districts that are just beginning to bounce back from the economic downturn. We look forward to continuing to work with the Administration to help ensure that the U.S. remains a leader in solar energy, and we’re optimistic that the president will recognize the opportunity that lies ahead.